For the next few weeks we will be having the Dog Days of Summer Series. You guessed it featuring our very own Chloe, testing products that will be great for dogs in the summer. 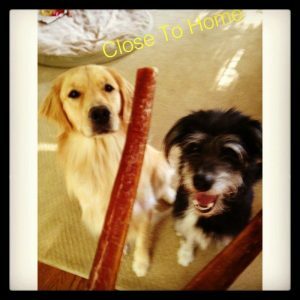 Check back frequently as we have several giveaways going on in addition to the great dog product reviews. So grab your dog and your car and learn how you make car travel easier. Taking a road trip with your family this summer? If so does that include your four-legged dogs? 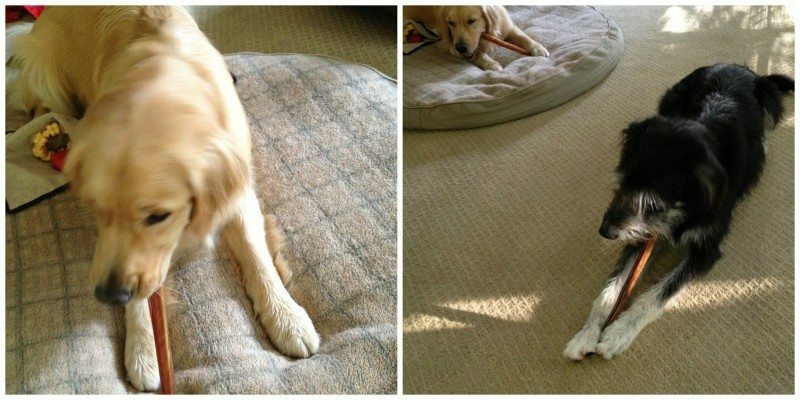 We have taken our pup, Chloe on a few trips in the past and have given her treats like bully sticks to keep occupied. Wow, they often create smells from some of these dogs treats that will make us open our windows in 100 degree weather. I think I have the solution for your next road trip with your dog. Chloe looks very interested in this antler. Chloe can take down a bully stick in a matter of minutes but that does not help the odor we have endured when we have given them to her in the past. 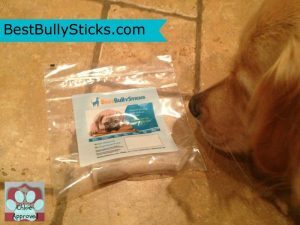 This past weekend we had a doggie sleepover and to occupy our two dogs I gave them each a BestBullyStick.com thick no odor bullystick. As you can see they both dogs truly enjoyed their bully stick treats and in fact no odor ! BestBullySticks.com is located in my hometown of Richmond, VA. They have all sorts of treats and toys for your dogs at great prices. The BestBullysticks are much cheaper per stick than I have seen them at local specialty pet stores here. . Go check BestBullySticks.com for your other dog travel needs and treats such as this cooling mat for hot summer days or portable crates. If you are traveling with your dog and do provide them with treats to occupy them be sure and also have fresh water available. Chloe is always thirsty after devouring her bullysticks. If you dog is in a crate in the back of the car, you might consider a crate fan to keep them cool. Bring a copy of their rabies and recent vaccinations and research emergency vets at your travel destination just in case. « How to save money on grocery bills with Zaycon Foods. Sissy’s favorite treat is frosty paws. I even make my own peanut butter version just for her. My pup’s favorite road trip treat is a loaded Kong. They love the little done rawhide’s! 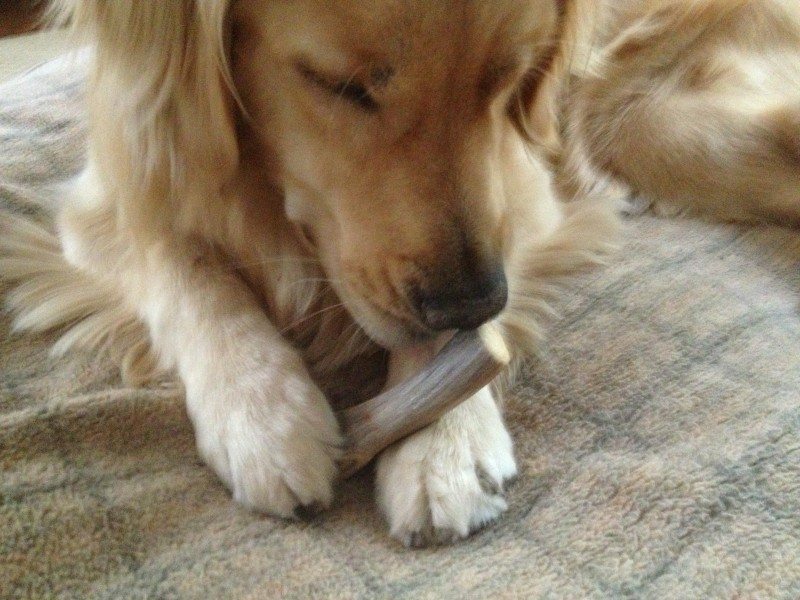 Bully sticks, antlers, and himalayan chews are great for keeping my dog busy on trips. I don’t have a dog anymore – but we live on a campus where I’d have lots of doggy friends to pass these out to – but when we did, a Kong with peanut butter! Ladyblueeyez1960 (at)(aol)(dot)(com)heir chewy… which is a sock with a knot tied in it. My dog doesn’t do road trips. He gets car sick. He loves all sorts of treats, greenies, Kongs, and Bully sticks to name a few. My dog’s favorite road trip treat is his dirty stuffed rabbit he has to carry everywhere. My dog, Mouse, loves this really dirty stuffed dog we keep in the car. I’ve tried washing it many time, but it always gets just as dirty. My dog LOVES Kong toys!! She likes ANY treat and any of her toys once we arrive at the hotel – in the car she doesn’t like anything, she’s not a fan of the car.